The beautiful Basque Coast is just a short drive away and this is the perfect place for visitors to discover during their camping holiday. Bicycle paths lead guests for more than a hundred miles along the coast and into the surrounding countryside and there are plenty of charming villages to stop in to gain insight into the local culture. 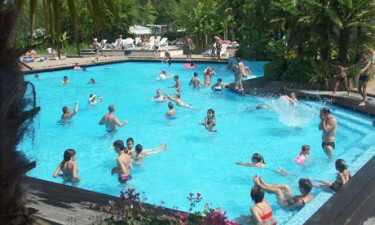 Why choose Camping Village Tropical Sen Yan? 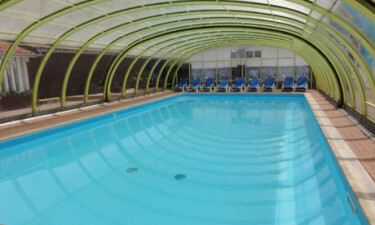 In addition to a heated indoor pool that is open all year round, the site also features two large outdoor swimming pools. The largest of these comes complete with a pretty water garden and water slides. A large number of stretches of golden sand line the Atlantic Ocean and can be reached in less than ten minutes from Village Tropical Sen Yan. While cycling or simply walking are popular ways to reach the sand, a special shuttle bus is also available.